The reason why I fight for justice is because Kenny Lazo is my son’s father. My name Jennifer Gonzalez, Co-Founder of the Justice for Kenny Coalition and long-time partner of Kenny Lazo. The obstacles family members face after a loved one is killed by police is horrifying and emotionally draining, as I experienced myself. Consequently, we must keep the fight for justice going strong and provide support to the growing number of families effected by police violence. I would like to share my story with you. On the night of April 12, 2008, Kenny fell victim to a ruthless and malicious crime, and my life and our son’s life would be changed forever. Kenny’s life was taken by individuals who ironically swore to protect and serve: the Suffolk County Police. Kenny was pulled over allegedly for going a mere 8 miles over the speed limit, an infraction most drivers are guilty of on a regular basis. The remaining facts are unclear as Kenny, the only witness to the crime, was handcuffed, forced down on the ground, beaten and choked to death with flashlights. He suffered from blunt impacts to the head, face, torso, arms, with multiple abrasions, contusions and lacerations of the face and scalp. His tongue was nearly bitten off. Succumbing to the vicious attack, Kenny went into cardiac arrest. He was then brought to the 3rd Precinct and provided with NO medical attention. As Kenny was taking his last breath lying on the precinct floor, an eyewitness heard the officers involved in the beating joking and proudly reenacting for all those in the front lobby to see how they tortured Kenny. The police then decided to wait a whole hour after Kenny was brought to the 3rd Precinct, before calling the EMT. Kenny was found by emergency assistance lying DEAD on the floor in nothing but his boxers. Inexplicably, the autopsy report was not released for several months after Kenny’s death. The Suffolk County Coroner ruled Kenny’s death HOMICIDE as a result of his injuries, but refused to state who was culpable. We brought two cases against the Suffolk County Police Department: each individual officer and the DA’s office. The criminal case was quickly dismissed – none of the 5 officers involved were indicted or charged, which is very typical for police brutality cases. Currently the civil case is still pending, but we have little faith that the police officers will be held accountable for the murder of our Kenny. Thus, the burden is on us to hold the murderers accountable. The Justice for Kenny Coalition was formed in April of 2010, on the 2nd year anniversary of Kenny’s death. Our members come from a range of backgrounds and include family and friends of Kenny, community organizers, educators, and artists, nationwide and internationally. Our mission is to spread the story of Kenny Lazo and other victims, engage people to talk and think critically about Police Brutality, and empower the Long Island community and others to stand up for all of our Human & Civil Rights. For the past six years, I have been building with many organizations including the October 22nd Coalition, the ANSWER Coalition and ACD Media. While we have received a lot of support from the city, Long Island has yet to provide us with any sustaining assistance. Recently, I was able to connect with two families in Long Island, but there are so many more of us out here who are silenced by fear. Many of us are immigrants and are afraid of speaking up or following through with charges against the police. Most cases against the police are dismissed and the victims harassed by the police afterwards. This is why I am reaching out to families that are not only in Long Island but to those all over New York State and beyond. In the coming years, we would like to build a solid organization of families of police brutality victims along with a versatile network of community resources to provide support (including but not limited to effective and affordable lawyers, social workers, and medical providers). Of equal importance, we hope to unite all the families of police brutality victims to collectively push for change in a criminal justice system that has failed so many of us. The most effective way for change to happen is by building together. We must create a movement that is more than just one or two families. Together, we can be the powerful catalyst this system needs to change. While these questions plague my thoughts too often, I know that we must continue to be strong for our loved ones and to fight for them. My son’s father and the other victims will never be replaced or brought back to us, but I know if we were together and united, we would have the potential and power to prevent more victims of police brutality. 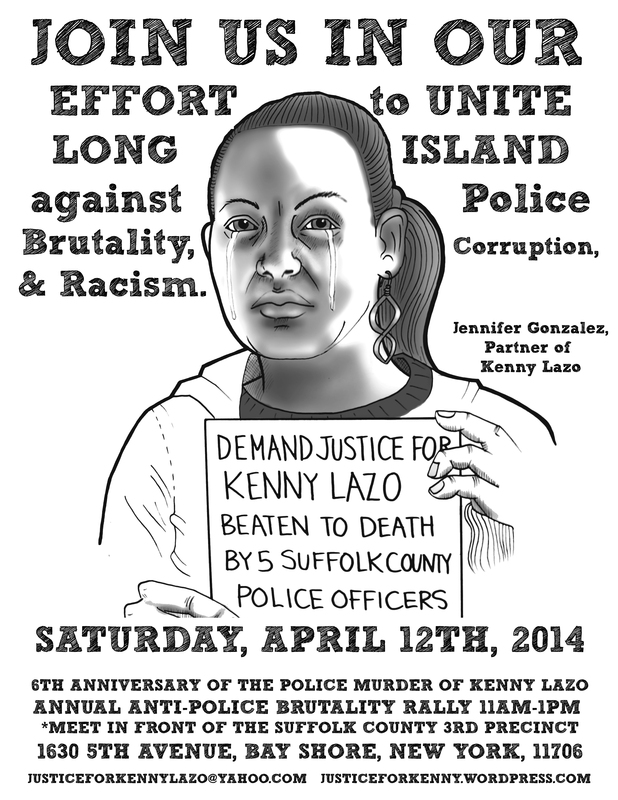 I am personally asking you to attend our annual March on 5th Avenue @ 1630 5th Avenue, in Bay Shore, New York, for Kenny Lazo & all police brutality victims on Saturday, April 12th, 2014 from 11AM-1PM. If you have also been affected by police violence, I invite you to share your story with us during the vigil. From my experience, sharing stories empowers community, and I know yours can empower ours. Please consider my invitation, we would love your presence very much. We will be hosting two fundraisers on March 22nd in Long Island, and March 30th, in New York City. Please stay tuned. Thank you kindly for your time and attention, and please feel free to write me at JusticeforKennyLazo@yahoo.com, or call me (631) 835-9791. Our flyer! Please PRINT & SHARE! Come Out & Participate in History! Thank you for sharing your story Jennifer! I am going through something similar myself at the moment and feel quite alone in this fight against police brutality!! I am sooo sorry for your loss and admire you for taking a stand and continuing to fight in the midst of such a traumatic event. I would love to talk to you further and share my story with you. Maybe you could give me some advice as well as some recommendations on a lawyer.